The Jewish Wedding is a simple and beautiful service. It can be creatively adapted or enjoyed in the original traditional format. Traditionally, a Jewish wedding is divided into two halves because in ancient times the betrothal took place a year before the couple moved in together. Now both ceremonies are joined together. In the first part, called Erusin, the couple give a ring or rings to symbolise their union. This is preceded by a blessing said over wine. 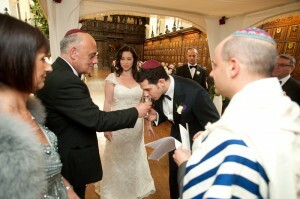 Inbetween the two parts of the service the Ketubah is read out. This states the details of the marriage and the obligations that the couple make to each other. The second part, called Nisuin, consists of seven blessings said over wine. In the conclusion the couple are blessed by the rabbi and break the glass. Apart from including other readings and songs / melodies, the Ketubah can be personalised, made egalitarian and the seven blessings can be said by different friends and new blessings can be created. together and I know we can create a beautiful ceremony that expresses who you are. Please contact me to discuss your wedding needs.